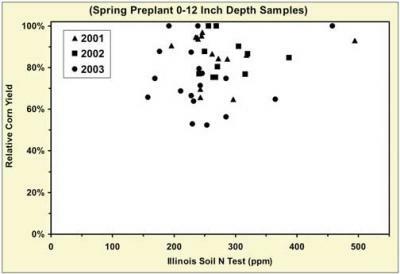 What is the Illinois Soil N Test (ISNT)? The test was developed several years ago at the University of Illinois by researchers in the Department of Natural Resources and Environmental Sciences. It is a laboratory procedure designed to measure N liberated from soil heated for 5 hours with dilute alkali solution (sodium hydroxide). 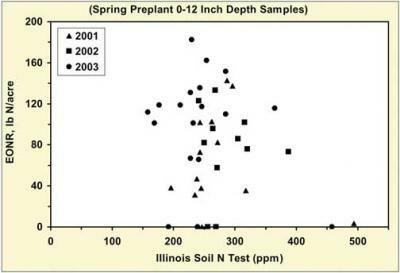 The test does not measure nitrate, but does measure exchangeable ammonium and a fraction of soil organic N. The theory behind the test is to extract a specific component of organic N from soil collected before planting and N application that can reflect the amount of N mineralized in a growing season to plant-available N forms (converted to inorganic ammonium and nitrate). The concept of estimating mineralized soil organic N is not new, as many biological and chemical methods have been proposed for the past 50 years. At best some of those tests predict available soil N in closed systems, such as in pots under greenhouse conditions, and none have been proved useful in predicting plant-available N in open systems such as field conditions. Unfortunately, it is extremely difficult to predict mineralization that might occur in the field with a lab test. This is the reason there has not been a reliable test developed or recommended to date. Why is use of the ISNT test an issue? The ISNT is currently being suggested by some individuals as a useful means for adjusting N application rates to corn in Iowa. This is disturbing because no guidelines are currently in place either in regard to sampling procedures or ways to make N rate adjustments for mineralizable N under field conditions. Use of the test is not incorporated into Iowa State University Extension publications or N recommendations. Also, the test has not been approved through the Iowa Department of Agriculture and Land Stewardship, Iowa Soil Testing Laboratory Certification Advisory Committee, and is not supported by the North Central Region NCR-13 Soil Testing and Plant Analysis Committee. What has research in Iowa shown? The ISNT test was evaluated in 43 on-farm N rate trials across Iowa in 2001-2003. The trials were designed to attempt correlation of test results to corn yield response to N and calibration for N rate prediction. Results were very disappointing. Figure 1 indicates absolutely no correlation between ISNT value and relative corn yield when no N is applied. This means test results are not indicative of soil N supply or mineralization. Figure 2 shows absolutely no relationship between ISNT value and economic optimum N rate (EONR). This means the ISNT test cannot be used to estimate or adjust corn N fertilization rates. Figure 1. Lack of relationship between relative corn yield when not fertilized and the ISNT value for 43 on-farm trials in Iowa (data from J. E. Sawyer). Figure 2. Lack of ISNT relationship with economic optimum N rate (EONR) from 43 on-farm trials in Iowa (data from J. E. Sawyer). This article originally appeared on page 203 of the IC-494(24) -- October 10, 2005 issue.